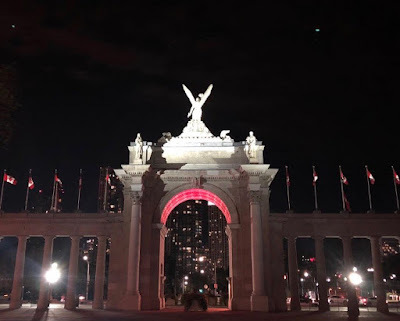 i'd meant to go to the toronto celebration last year but didn't quite get around to it, so this year i made sure i was there, and thankfully emma had a spare ticket i could buy off her (the saturday-night ein prosit party was sold out). and honestly, for me, big dumb germany superfan, this festhalle party was tops. so many costumes! so much beer! (and yes, they had a traditional brass band playing polka.) did i have to stop myself from tacking on german words to my sentences because that's how my brain works now? sure. (i do love me some spicy sausage, though, but someone really ought to have warned me that the hot mustard is no joke) the hot potato salad had a bit too many fennel seeds, but i will always scarf down so much german beige food. and i definitely got a laugenbretzel on the way out, although again, foiled by the incredibly hot mustard. 10/10 would still eat again. 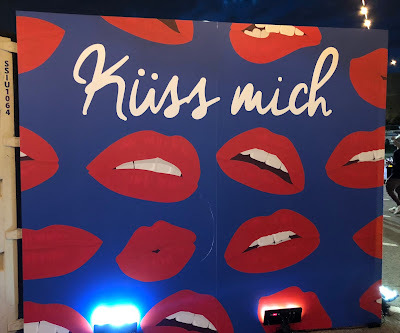 rammstein has a song called "küss mich" and it's...sort of about kissing...but like...not where you'd think? uh, anyway. 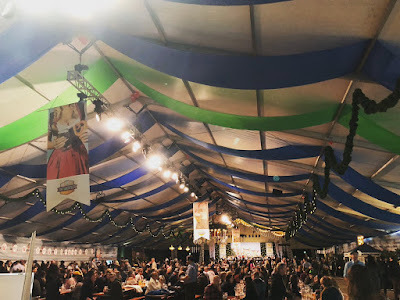 so oktoberfest in toronto was a joy - you'd be surprised at how willing you are to dance at the front of the stage after three beers - and i lost track of how many times i gushed, "oh my god, this is adorable." i mean, i don't think i'd ever be taking the trip to munich for the real thing - munich's expensive, and oktoberfest there is overrun with tourists - but i would clearly go back to berlin for lichterfeste in october. it seems like a given that r+ is going out on tour next year, but on the off-chance that they don't, i'm definitely planning on making that trip. berlin in october, please yes. tangentially related: i'm currently obsessed with good german chocolate ritter sport. even more so if i can find one in its original german packaging. 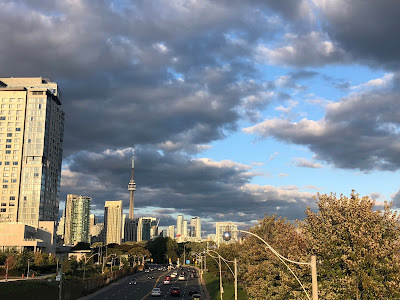 but here and now, though, most people are focusing on the fact that it's a long weekend coming up; it's canadian thanksgiving this sunday, so everyone's getting time off and travel plans in place and so on. but me - and i think i mentioned this before, but whatever - i'm staying here in toronto, for what i'm pretty sure is my first-ever thanksgiving long weekend not spent in kingston. i'm serious - i thought on it, and i can't recall a single thanksgiving that i didn't go home for. thanksgiving's always been a part of it, but it's been more so because both my birthday (the 9th) and my father's birthday (the 11th) are around the holiday, so it's a "three birds with one stone" scenario. this year, though, i dunno. i just don't really feel it. it's a lot of maneuvering and coordination to get me to and from the island where my mom and stepdad live, and i wouldn't even be there for very long, and it's too much money for me right now. also, my dad and stepmom are only just getting back from croatia & austria on the 6th, and they already told me that they're not planning on doing anything for thanksgiving sunday. so now hopefully i don't feel too bummed out to miss the family thanksgiving, and likewise my birthday, because left to my own devices i can't see myself actually doing anything on my birthday. so in reality, i'm likely going to spend my birthday doing very little, unless i decide to hit up the movies or grab a nice (yet cheap) lunch somewhere. i'm easy to please, and i like my own company. (also, straight up, i am poor, my guys. i don't have the cash to splash out on a day of good times for myself. at least i don't have - and have never had - expensive wants or needs.) but i can unequivocally say that a year ago, i didn't expect to be back here, sitting around my apartment in my pjs all day and searching for jobs to apply for. that's the thing about life, though - you gotta be ready to roll with the punches, whatever happens. dust yourself off and get back to it. and with that, i'm continuing to get back to it. enjoy the first week of the best month!